Summer is when I think beach and in Croatia there are lot to choose from. (See a selection of Croatia’s best beaches) If you live in Croatia, of course you have your beach equipment already sorted out: towel, beach shoes, chair, umbrella. As a visitor however, it’s easier to let others handle your comfort. That’s where beach clubs excel. Nothing is more relaxing than being shown to your lounge chair with the umbrella turned just so while a beach staff waits to provide you with a snack or a fruity cocktail. Ah, summer on the Adriatic! And here are the best places to pamper yourself the length of the Croatian coast. Only steps from Ploce, Dubrovnik’s eastern gate, this beach club on Banje Beach offers sun-baked relaxation during the day and a trendy lounge bar when shadows fall. Gaze across the azur waters to Lokrum Island or treat yourself to a massage. Thai, Swerige, Hot Stone and more are available. Prices are 200Kn for two lounge chairs and an umbrella. See the Banje Beach website or see more on Dubrovnik beaches. Staying in Lapad or Babin Kuk? There’s no reason to trudge to Banje for a private beach. Coral Beach Club is next to the Hotel President and overlooks the crystal clear waters of Dubrovnik bay. It has a quieter and more local vibe and the bar turns out smashing cocktails. See the Facebook page or see more on Dubrovnik beaches. The legendary cocktail lounge, Carpe Diem, ferries beachgoers out to Stipanska Island where a beach club awaits on the edge of a pine forest. The decoration is a summer dream of bamboo, teak and straw and the views over Stipanska bay are luscious. Relaxed and unpretentious, the beach club also hosts a pool and crepe bar. See the Carpe Diem website or see more on Hvar town. Prefer not to stray too far from Hvar town? Bonj ‘les bains’ is for you. The white stone colonnade outside the Amfora Beach Resort Hotel provides an elegant setting to wallow in luxury. Lounge on mattresses in a private baldachin or take in the stunning views on a comfortable beach chair. Enjoy a relaxing massage and finish the day with a meal at the excellent restaurant. Prices start at €35 a day. See the Bonj ‘les bains’ website or see more on Hvar town. You can rent a chair and umbrella at Bacvice beach in Split, but for the ultimate luxury head out of town to the Radisson Blu Hotel in Trstenik. There you can have use of the indoor and outdoor pools, sauna and showers for 150Kn. A beachside chair is an additional 40Kn but get there early as they tend to fill up! See more at the Radisson Blu website or see more on Split beaches. 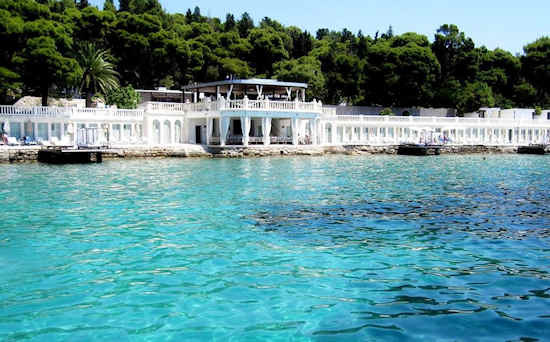 Here’s the place to follow sunbathing with the wildest party scene on the Adriatic. 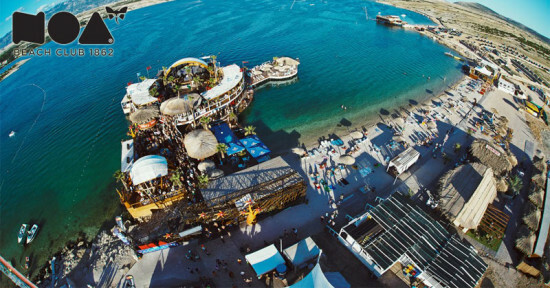 Located on world-renowned Zrce beach in Novalja on Pag Island, the Noa Beach Club is a village unto itself. Work on your tan during the day on lounge chairs bordering a shallow, sparkling sea. Try a massage or a workout in the open-air gym. Then have cocktails in the After Beach area while waiting for the party to start, often featuring Europe’s best DJs. See more at the Noa Beach website or read about Novalja and Zrce beach. The newest entry on the Croatian beach club scene is the stunning, minimalist Mulini Beach Club located on Lone Bay between the five-star hotels Monte Mulini and Hotel Lone. The service is impeccable here and the views of Zlatni Rt Nature Park are mesmerizing. It will cost you 450Kn for two lounge chairs and an umbrella. See more about Rovinj.